In this article, we’ll explore Business Intelligence trends, particularly for the remaining half of 2015 and beyond, so you can continue making informed, dynamic decisions about the future of your company. Remember the 4th of July? That was nearly a month ago, and we don’t even have time to think about it because conferences, business meetings, new collaborations, and other corporate tasks are filling up our agendas and calendars. But we have to stay focused both on the big picture and the detail-oriented side of things, so that our organizations stay on track for the successful future we envision. One of these elements has to be how we access, manage, and evaluate our company information for impactful, data-driven decision-making. 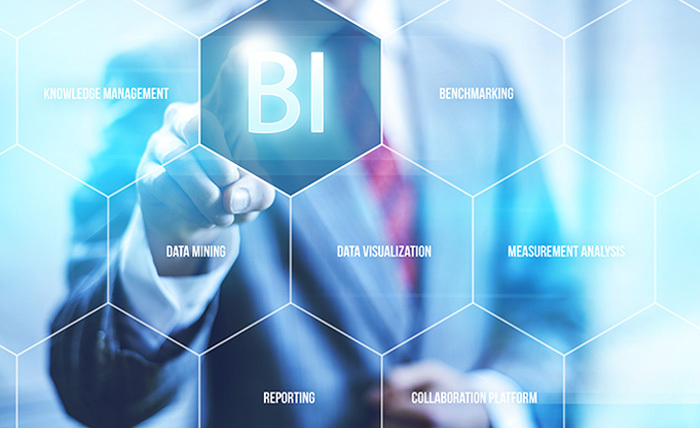 This article will zoom in on what is going on in the Business Intelligence (BI) world, specifically in terms of software options and how we analyze our data for more effective planning. Let’s start by talking about what you already know: the amount and significance of your data is growing exponentially. You have watched this aspect of business continue to grow, and you’re likely participating by mining, using, and/or evaluating your organization’s large amounts of data. Relatedly, first up in terms of trends in the software marketplace is that a product has to be able to accommodate this growth in order to stay competitive and relevant in today’s consumer landscape. One way to accomplish a consolidated data storage space and procedure for your variety of data types is a commercial data warehouse. Data warehouses used to be a development project for IT employees, usually spanning years and costing companies a substantial amount of money to design a company-specific data warehouse. With the length of time associated with homegrown data warehouses, team members might join and leave the project, so it can be tedious. Today, commercial data warehouses are a popular option, fully built and configurable, like accounting systems. Data warehouses are newer in the software world, quicker and more affordable than building your own data store. In particular, these commercial products are becoming more practical as corporations have multiple systems that make up their data, spread between Cloud and on-premises. Commercial data warehouses enable your team to bring all of your information together in one space for richer, simpler reporting and analytics. Powerful, organized analytics have to be paired with business user friendliness. Self-service BI is a big buzzword today in the software marketplace today. But some BI solutions lack the abilities to adequately prepare your raw data into meaningful intelligence that end users can interact with, interpret, and make sense of for accessible decision-making. In particular, some “self-service” BI solutions do not have business rules built-in, so your raw information is not prepared for proper analysis. The best software will come equipped with business rules, perhaps in metadata form, like Solver’s BI360, to transform your raw information into objective, measurable data. It is this type of ability that adds to a streamlined, seamless user experience. To continue learning more BI Trends for 2015 and beyond, read the rest of this article here.